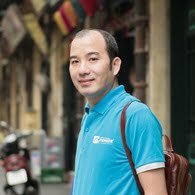 HomeTravel BlogWhat is so hot in Mekong Delta of Vietnam? 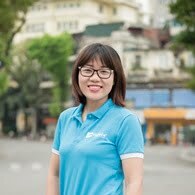 What is so hot in Mekong Delta of Vietnam? A Vietnam trip will never be completed without a visit to Mekong Delta region, a vast maze of rivers, stilt houses, and rice paddies. 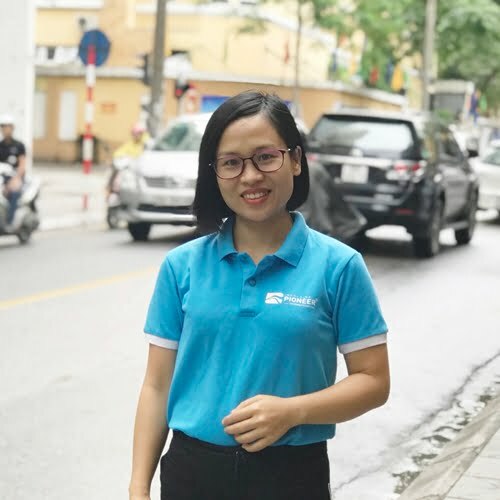 Here you can find exotic experiences, and the chance to immerse yourself in a lush land with the unique Vietnamese life-style feeling which is hard to find in anywhere else. So what are all the highlights of this magical region? 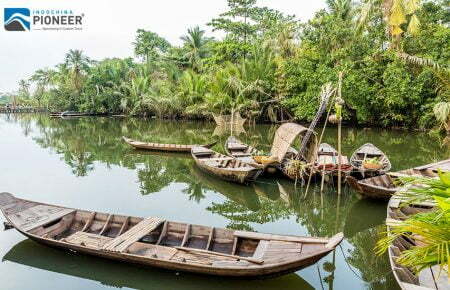 We have prepared a list of all the Mekong Delta must-sees for you. 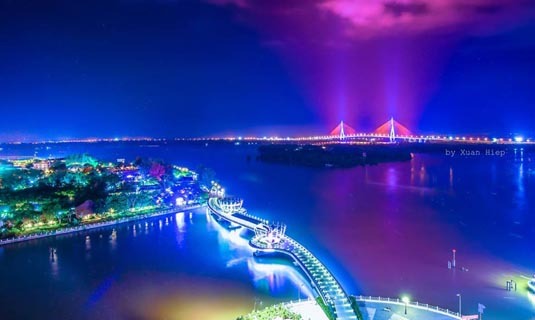 The most interesting place to grab a taste of Mekong Delta night is Ninh Kieu Wharf located close to the Can Tho city center, on the bank of the Hau River. Over at the wharf is a park that covers an area of about 7,000 m2, with a number of bars, restaurants, and hotels scattered around this area. 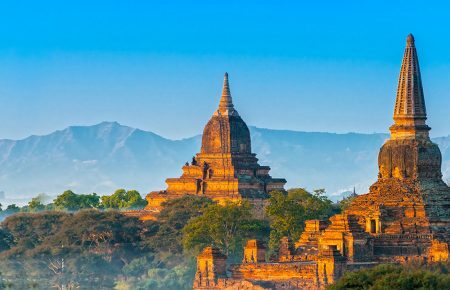 The activities are endless, you can take a leisure walk in the sunset, take a few pictures of the gorgeous waterfront that is packed with colorful fishing boats, have some dinner at a riverside restaurant or explore all the vibrant night markets around. The big wholesale market, Cai Rang, in Can Tho, is one of the unmissable highlights in any Vietnam tour. 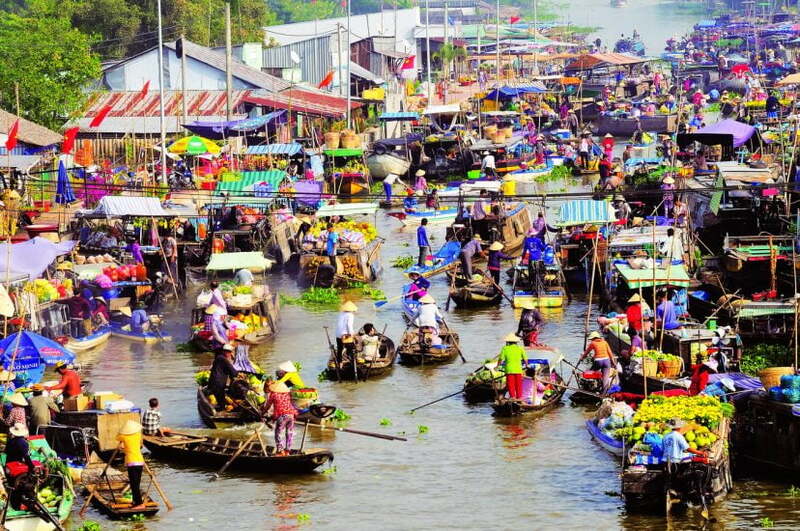 A visit to this charming country will be not completed if you miss the chance to experience the largest floating market in the Delta. With fruit lovers, this market is really a heaven on earth as you can find all sorts of tropical fruits being sold here. Most of the boats in Cai Rang are packed with a lot of farm products and specialties of Cai Rang Town, Chau Thanh district and the nearby areas like vegetables, coconut, banana, watermelon, grapefruit, dragon fruit and so on. 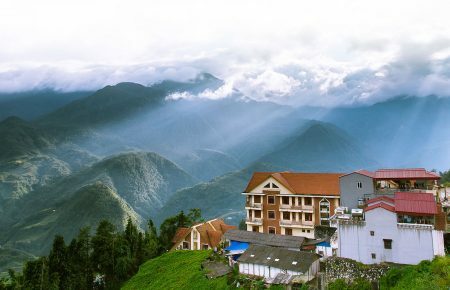 To catch the liveliest scenery and enjoy the most animated atmosphere of Cai Rang market (often 6 am to 8 am), travelers should stay overnight in Can Tho and come here at the dawn, about 5 a.m. You can enjoy beautiful views of the sunrise on your way. And also don’t forget to try “bun ca” (fish noodle soup) or “hu tieu Sa Dec” (dry noodle) for breakfast before your lovely journey starts. 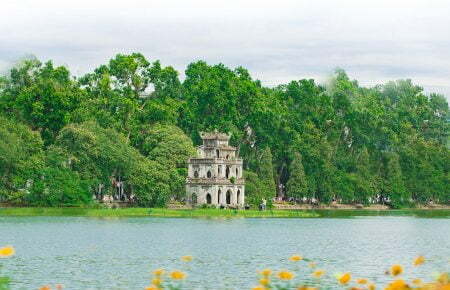 This pagoda, located in My Tho, Tien Giang province, was built in 1849 and occupies an area of about 2,000 m2. 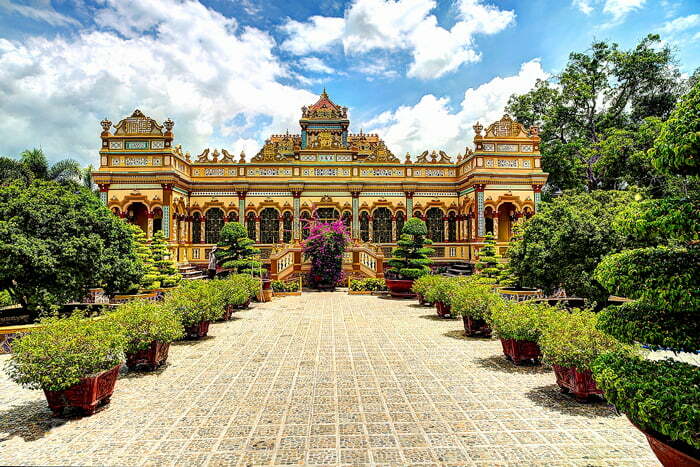 The architecture is a melting pot of Chinese, Vietnamese, Khmer and European styles, and the site features various Buddha statues, a beautiful ornate gate built by craftsmen from Hue, mosaic decorations made out of broken pottery, and intricately detailed woodwork inside. 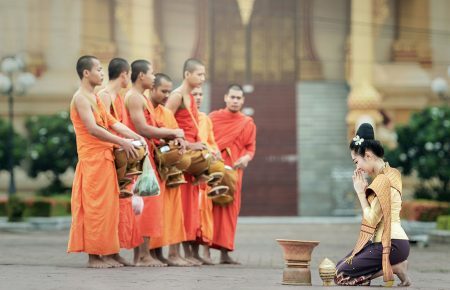 Visit around 10:00 a.m. and you will hear the sound of monks chanting peaceful Buddhist prayer verses. 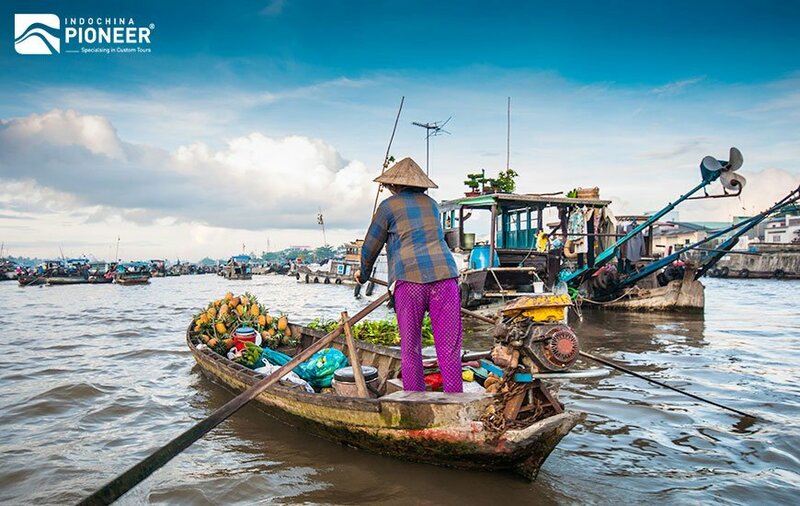 Located on the giant Tien river, the Cai Be floating market is a hub for transporting agricultural goods and seafood from the Mekong to the rest of Vietnam. This is highly recommended for visitors who have never had experiences with floating markets before. The floating market is open later than most, so you can visit late in the day and still experience a bustling atmosphere. After getting embarkation, you will be amazed at the colorfulness and excitement of Cai Be. Most of the boats here are packed with exotic fruits, with aside activities for travelers is accompanying with the local people to see them doing fishing. 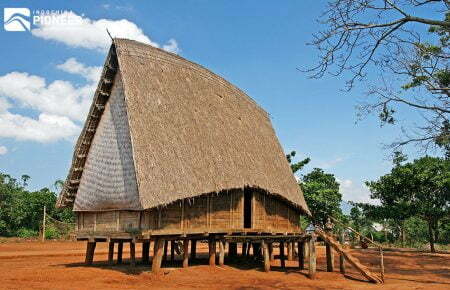 You also can visit some ancient houses and local home-made coconut candy factories where you can learn how they make coconut candy and try some “hot” candies. 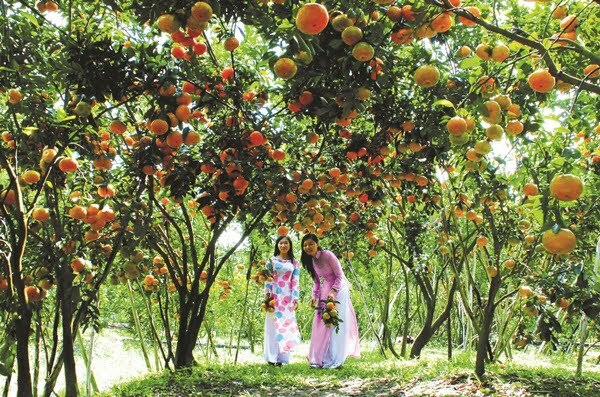 The Mekong Delta provides 70% of the fruit consumed throughout Vietnam, and there are plenty of fruit orchards scattered around the different provinces that make up the Delta. You will be able to find various fruits such as mango, grapefruit, guava, apple, jackfruit, dragon fruit, mangosteen, plums, durian, etc., being cultivated. Cai Be Orchard is the largest fruit orchard in the Mekong Delta. You can take a tour through the premises, pick ripe fruit off the trees and enjoy them right then and there. 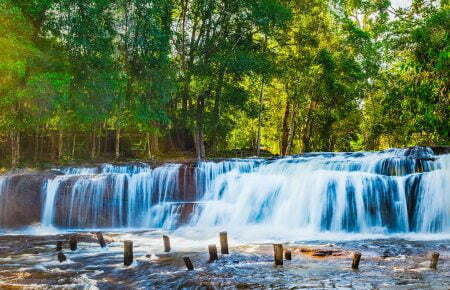 Located in the An Giang province of the Mekong Delta, this fascinating ecotourism site is a vibrant forested area that is dry most of the year. However, come the end of the year during the rainy season (from September to November), the area turns into a flooded forest, making it ideal for a guided boat tour through the region. And this is where all the magic revealed. The Tra Su mangrove forest is a paradise on earth, and as such it’s very difficult to describe it using words or even with photographs. The whole area is covered in a pure green coat, with a peaceful feeling saturated in the atmosphere. It is just like losing your way in a total different wonderland.